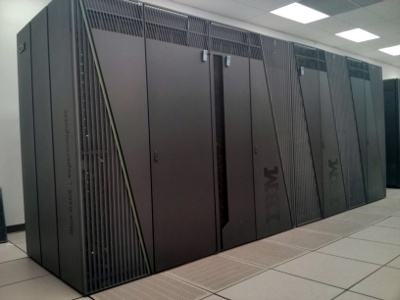 The BGQ is a Southern Ontario Smart Computing Innovation Platform (SOSCIP) BlueGene/Q supercomputer located at the University of Toronto’s SciNet HPC facility. The SOSCIP multi-university/industry consortium is funded by the Ontario Government and the Federal Economic Development Agency for Southern Ontario . A half-rack of BlueGene/Q (8,192 cores) was furthermore purchased by the Li Ka Shing Institute of Virology at the University of Alberta in late fall 2014 and integrated into the existing BGQ system. The BGQ is an extremely dense and energy efficient 3rd generation Blue Gene IBM supercomputer built around a system-on-a-chip compute node that has a 16core 1.6GHz PowerPC based CPU (PowerPC A2) with 16GB of Ram. It consists of 4,096 nodes with a total of 65,536 core and upto 262144 hardware threads. The nodes run a lightweight Linux-like OS and are interconnected in a 5D torus. The compute nodes are accessed through a queuing system. A quickstart guide to using the BGQ can be found on SciNet’s technical documentation wiki. SciNet is the supercomputing centre at the University of Toronto.